The Pens begin the final stretch here with a trip to Detroit to take on the struggling Red Wings. Currently the Wings are holding on to the 8th spot in the West by a messily 2 points, a far cry from last year. Guess they're the ones having the hangover, no? Though as of late the Wings are playing better with a 7-2-1 record with wins over Chicago, Vancouver, and Buffalo. Datsyuk and Zetterberg are tied for most points on the team with 60; certainly not a good year by Datsyuk standards. In my opinion the Pens have been playing some mediocre hockey as of late. Two recent OT losses to Carolina and two failed attempts to at trumping the Devils is certainly not the best way to finish the season. Nevertheless they are in the number two spot in the East and can gain some ground this week if they can knock off the Caps on Wednesday and the Flyers on Saturday. Yeah, its rivalry week. Here's a look at the current standings. 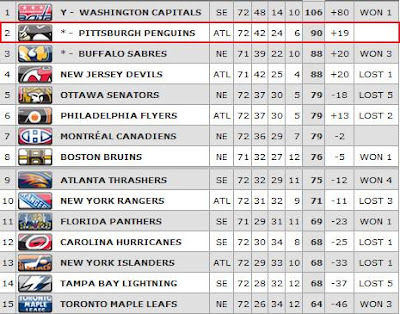 Apparently the Pens and Habs are streakless. Trib reports Geno and Cooke missed practice this morning. At this point its not know whether they are related to injuries, Bylsma just reported them taking maintenance days. Geno did note he he aggravated his foot injury against the Canes. You and I couldn't tell, he scored in the third, but Geno's a strong kid. Jason Seidling from the Pens Offish has a good article on the Final Push. With Geno back in the line up and a goal under his belt after the recent return, I expect big things from the Pens. No word if he'll play just yet. Quite honestly this is a good game to start the week off. Perhaps a win could spark some rejuvenation of confidence they had last year during the playoff stretch. The last time these two met we saw a battle on NBC and subsequent shootout win thanks to the quick draws of Sid and Geno. Staal always tends to have a big game when he travels to Detroit, lets see what we'll get out of him. As for the keys to the game, well, the main thing is the Pens need to continue their barrage of offensive prowess. They need establish a heavy forecheck and gets shots on net, early. This will likely shake up rookie goalie Jimmy Howard and get the Wings defense on their toes. This is also a good time for the Pens powerplay to start churning out some more goals. Likewise they need to keep an eye on the bouncing pucks. I'm talking to you MAF. If Malkin sits the lines will be drastically different, but as of now this is what they'll look like if he plays.